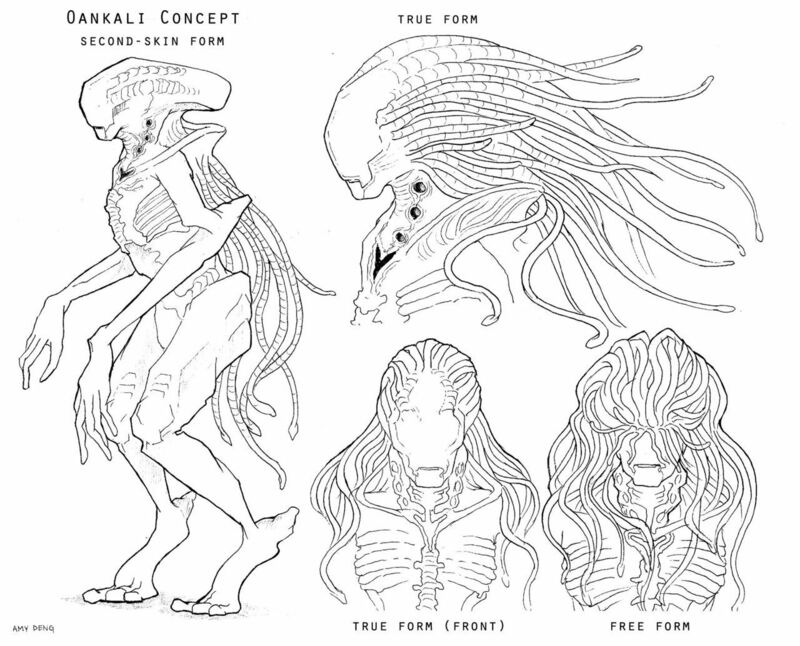 Amy Deng’s Oankali for an art exercise “Imagining the Oankali.” A Google image search for Oankali and Ooloi does’t turn up much other than a lot of rough fan art, but I liked this drawing a lot; as much because of its analytical approach as the representation itself. For the second year now, I’ve read an Octavia Butler novel during the month of February. February, being black history month, seemed like a good time to read her work and pay respect to one of the greatest science fiction authors. However, it’s also a bit ridiculous to only relegate her work to one month a year and I plan to finish the Xenogenesis trilogy (aka, Lilith’s Brood) this year. I especially love science fiction with truly “alien” creatures and Butler’s Oankali are unique in every aspect. But if you’re not familiar with Octavia Butler and her work —and I wasn’t for most of my life— take some time to learn more about her. She was by all indications a genuinely wonderful person who proved having diverse points of view are important to science fiction or any genre. I particularly enjoyed reading this interview from In Motion Magazine, which was likely one of her last as well as watching this interview with Charlie Rose for PBS. Science fiction and fantasy genres have always had an issue with a lack of diversity and it is extraordinary what she accomplished for women and people of color. Parable of the Trickster – if that’s what the next one ends up being called – will be the Seattle novel, because I have removed myself to a place that is different from where I’ve spent most of my life. I remember saying to Vonda McIntyre, ‘Part of this move is research,’ and it is – it’s just that Seattle is where I’ve wanted to move since I visited there the first time in 1976. I really like the city, but it is not yet home. As they tell writers to do, I’ll take any small example of something and build it into a larger example. I’ve moved to Seattle; my characters have moved to Alpha Centauri, or whatever. (That was not literal.) But they suffer and learn about the situation there a little bit because of what I learn about from my move to Seattle. Writers use everything. If it doesn’t kill you, you probably wind up using it in your writing. So if you’re inspired to learn more about African-American contributions during Black History month, then by all means start with Octavia Butler. Just be sure to not leave her there but continue enjoying her amazing writing anytime. 2/20: Influx by Daniel Suarez – I’ve not read the most recent books by Suarez, but I loved the Daemon series and plan to read these Gibson-esque near-future novels. 3/3: Words of Radiance by Brandon Sanderson – I just finished the first Stormlight Archive novel (and it’s massive) and it is already one of my favorite fantasy series, with a very unique world and terrific characters. 3/11: Mentats of Dune by Brian Herbert & Kevin J. Anderson – Okay, I’ll be the first to admit that the sequels/prequals/expanded universe novels haven’t been as good as the Frank Herbert novels. To be fair, not all of the Frank Herbert novels were on the same level, either. However, I’m such a Dune junkie, I eat these up with glee. 6/17: Cibola Burn by James S.A. Corey – A new Expanse book is also getting to be nearly an annual event, thankfully (of course, with two authors under one pen name, one would expect some turn around!). I started the series last year right on time for the third book, and I’ve been waiting for the fourth ever since about a day afterwards. 7/15: Half a King by Joe Abercrombie – Okay, I’ve got a few books to read in this fantasy series to catch up to this one, but I really liked Abercrombie’s first books. 8/5: The Magician’s Land by Lev Grossman – The Magician’s series has been one of the most refreshing things in all of fantasy in a very long time. I’ve eagerly awaiting the final(?) book in the series to see what ending befalls Quentin and crew. 8/12: The Fool’s Assassin by Robin Hobb – Another series I’ve got to play catch-up on, but I really liked the first two novel of Fitz and the Fool. 8/26: Lock In by John Scalzi – It’s a new storyline (and possibly a series; at least there’s a novella to precede it), but Scalzi’s wit is always welcome in science fiction. He’s already released a novella in the same world as this novel. 10/7: Ancillary Sword by Ann Leckie – Ancillary Justice was one of my favorite books of last year and I’m very happy that Leckie had the second novel in the series in the chamber (or she is an incredibly fast writer, which is rare but would be welcome). Her first book was nominated for almost every award imaginable and I sincerely hope she wins them all! 10/7: Armada by Ernest Cline – I loved Cline’s first novel and can’t wait to see what he’s got next. Update: Well it was bound to happen for at least one book on this list. This title has been pushed back until July 2015. 10/21: The Abyss Beyond Dreams: Chronicle of the Fallers by Peter F. Hamilton – A new Commonwealth universe book! 10/28: The Peripheral by William Gibson – He’s back into the dystopian, distant future. Not that I haven’t enjoyed the future-of-10-minutes-from-now novels, either. 11/18: Clakkers by Ian Tregellis – A new series starting in Tregellis’ coldest war universe. 11ish? The Thorn of Emberlain by Scott Lynch – A new Gentleman Bastards book is getting to be like clockwork from Lynch. So far, he’s kept the characters rich and slowly pulling the curtain back on a much larger fantasy world. This one doesn’t yet have a firm release date, but I’m holding out hope. Of course, it’s highly possible (actually, almost certain) I’ll not get all of these books read by the end of 2014, but I welcome the challenge gladly! It’s tough to pick just one that I’m most anxious about, but it would probably have to be Ancillary Sword . I was going to end this post with a pithy remark how if only Patrick Rothfuss and GRRM would release some new novels this year, it would be complete. Well, no new novels, but Rothfuss is releasing a novella in the Kingkiller Chronicles in October and GRRM is also contributing a Game of Thrones (actually, Song of Fire & Ice) short story to a fantasy collection ( Rogues ) out next month he is co-editing (which also contains other stories from many of these authors along with others I enjoy reading). So, yeah, 2014 is pretty much shaping up to be a near perfect year for genre fiction! That being said, Patrick Rothfuss and GRRM having until about midnight, December 31st, 2015 to get out The Doors of Stone and The Winds of Winter until I start pestering them. I recently listened to the direct-to-English translation of Solaris commissioned by Audible.com. While I could appreciate much of the novel, I frankly didn’t find it all that enjoyable of a read/listen. I felt guilty about my 3-star review on Goodreads.com until I noticed that Patrick Rothfuss gave it 2 stars. I love science fiction with truly ‘alien’ aliens. That being said, perhaps Lem went a bit too far in creating something we literally cannot comprehent or communicate with. …this is a book review, so I’ll discuss the book and why I felt compelled to give a widely-regarded masterpiece only three stars. I can certainly appreciate that the book is about the inability for humans to effectively communicate with a truly ‘alien’ species. But the complete lack of any real interaction between humanity and the planet was frustrating. People go there and occasionally die, but their exploration with this largely inert thing consists of fly-bys. However, an entire branch of science has been dedicated to the planet/being. This results in lots of dry descriptions of explorations which sum to nill knowledge. Again, I concede it’s the philosophical point Lem is trying to make. I just argue it doesn’t make for the most engaging reading. It feels more like reading a National Weather Center’s description of the history of hurricanes in outer space (*makes note for idea of future scifi novel*). Further, I felt the inability of the scientists to get over the shame, guilt, etc. they feel about their visitors hard to connect with. There’s been a shift in common attitudes between 1961 Poland and 2013 America which perhaps makes it hard for me to grasp the attitudes of dedicated scientists. Kelvin clearly recognizes this issue and hopes to address it, but I never felt any sense of getting anywhere this nudge in attitudes. As I stated, I truly enjoy alienness in scifi, and I would recommend this book to anyone who does as well. I just wished I could have enjoyed it more. I finished the audiobook of The Windup Girl , Paolo Bacigalupi multi-award winning novel about life in a dystopic Thailand after global warming and genetic engineering have wrecked much of modern society. Bacigalupi is a wonderful writer and it is an imaginative story, worthy of the praise and awards that were heaped on it after the book’s release nearly two years ago. The story follows the intersection of a half-dozen-or-so key characters who have all found themselves in the Bangkok. While each character has a great deal of depth, it is really the city and—through the limited lens we’re allowed—the world that Bacigalupi describes that are the star. Often, the story told in a novel falls into one of two categories: an epic tale starting from small events leading to world-changing epochs and their aftermath or (and this is case with The Windup Girl) we are given but a narrow window into a greater world. Bacigalupi gives hints at the various events that brought about the lives we are presented in this story though very little is given as to where those lives go afterwards. We are just presented with a glimpse on the crossroads of these characters. While I found myself wanting more of their stories, I want to know more about the rest of the world even more so. I want to know about the inner workings of AgriGen. I want to know just what went down in Finland. And I want to know if life in Japan is as luxurious as it sounds when compared to the rest of the world in The Windup Girl. The audiobook is performed by the excellent Jonathan Davis. The first audiobook performance I listened to of his was Neal Stephenson’s Snow Crash, one that remains a high mark of narration in my mind. His wide range of accents and voices truly feels like a cast of performers. Unfortunately, unlike Snow Crash, the pace felt too slow in The Windup Girl. Davis’ pauses and cadences went beyond dramatic and bordered on tedious at various points. The book isn’t a particularly long novel but yet the performed at such a slow pace, the audiobook was terribly long. For reference, Snow Crash is 480 pages and the Davis-performed audiobook just over 17 hours where as The Windup Girl is 361 pages and the audiobook by the same performer is 19 and a half hours long1. Though I’m a fan of Davis’ work and look forward to listing to more of his reading, this particular performance drug on more than I cared for. Slow pace aside, the audiobook is good and the story is great. I highly recommend it and truly hope that Bacigalupi takes us back to this world again very soon. Last night, I finished the final book in Dan Simmon‘s epic science fiction tetralogy1, the Hyperion Cantos. My immediate reaction to the series’ conclusion was that I only want to read it again. They are just that great of a read. In fact, if anyone who knows me had read these previously and didn’t recommend them to me, we are no longer friends. I am sincerely angry that I didn’t read these as soon as they were published (though getting to read the whole series back-to-back is at least some compensation). I spent a portion of my college years looking for more novels like Frank Herbert’s Dune and, as it turns out, Dan Simmons was writing them at that same time. In spite of my significant and legitimately earned geek-cred.2, I have to confess a lack of knowledge when it comes to some of the high literature of science fiction. I have done my best and was raised well3, but I had decided that I needed to really educate myself on scifi and fantasy literature. So, I added any Hugo or Nebula winning books to my audiobook wish list at the library. 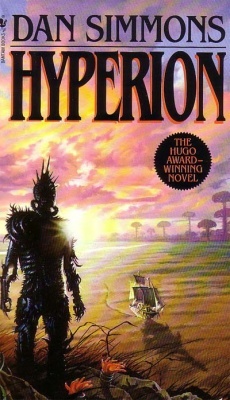 By luck, Hyperion happened to be one of the first that was immediately available. I didn’t have to get too far into that book to see that it was going to be something special. Oh, at first, it seemed like a science fiction version of Chaucer, but I’m pretty sure Chaucer didn’t have a Shrike; a creature describe with such terrible details that actually found myself looking over my shoulder at night. Something can be said for any book that can elevate your heart rate. And though the Shrike thing is undoubtable why many are attracted to the book, it is the sense of mystery and promise that something lies deeper. The reader quickly senses that there are layers here; that the story is unfolding in something other than a straight line. In fact, throughout the series, we learn that the events aren’t even simply parallel but truly nonlinear. Simmons uses various writing styles and literary devices, but always with a sense of purpose. When it I first feared that Simmons was simply exercising, it would later see that whatever device was in play served the story rather than some writer’s need to experiment. What’s more, there is a real sense of closure at the end that can only come from a writer’s long planning and effort. Though at times, Simmons could have left a little more to the imagine of his reader rather than grab them by the collar and shake them, I never felt a sense that he forgot the previous events in this epic. What’s more &emdash; and this is where I feel that the Hyperion Cantos is closest to the Dune series &emdash; is that even though this is an epic journey, with events spanning a millennium and detailing the evolution of the human race, the story focuses on a few key figures and remains a personal story of their journey. Journey, in the Hyperion Cantos, is a word which Simmons also embues with every meaning possible. Again, what feels like something which could have started as a creative writing exercise is place in perfect context to serve a greater story. I must not be alone as this is a series where each book was nominated for notable literary awards, with three of the novels winning one or more awards. Though this is truly a book that has all of the trappings of science fiction, the personal tales are the elements which make it great. I can tell you with no sense of shame that there were moments that brought tears to my eyes. So, if it is clear: go read these books if you haven’t. I won’t be the kind of friend who doesn’t recommend them. And, if any of you have any similar recommendations for me, you’d better make them now before I find them on my own. Else, we’ll be having words, my (former) friend. Which reminds, me I need to get back to my library list and see whatever great gems are out there that I have missed, including some others by Simmons. Watching this video of the Festo AirPenguin, I’m reminded that everything in William Gibson (@greatdismal )’s Bigend trilogy has already happened, just not yet in that order. In the prologue, Anderson mentions that his research showed two camps: those above thirty who remain skeptical of anything labeled "free" and those under thirty who think anything digital is generally free. This age definition has nothing to do with Tim Leary and everything to do with the timing of the digital revolution. It was my generation that really took the internets from a academic/ government experiment to the information behemoth that we know it as. These are the people that helped to create the new free and they watched and learned as others toyed with the idea. My position of "free is great so long as it pays" makes sense. I became an adult around this notion. My wife and I both have careers now that our users/patients don’t pay for directly but are added on to make our employers of greater value to the customers. So, it is from this perspective that I can say that many (most, even) of the core points in Free: The Future of a Radical Price by Chris Anderson are absolutely crucial to business. Especially small businesses and artisans, where nimbleness is a advantage to be leveraged. But still yet it is one that must be reckognized by old, large media such as entertainment and news if they are to flourish going forward1. First, the idea of examining what is abundant and scarce to you and leveraging those. It is equally important to realize that what is abundant or scarce changes over time and this is why business of old long since died off. Sometimes a commodity may not be truly free, but so cheap as to not make metering it worth one’s time. Using something like this to draw in customers and then getting money out of them (or even a select few, as I’ll get to momentarily) is a key part of making a business on Free. Secondly, if we are not going to measure something because it is free or nearly free, we can in fact being to waste this sort of commodity. When there is such and abundance of a commodity that we can afford to throw countless numbers into our business, some entirely new ideas can arise. Anderson provides many examples but suffice it to say that essentially everything we do on a computer these days would have once considered to be a frivolous use of precious resources. Thomas Freidman’s forces that flattened the world indeed have changed the economic landscape as well (ref. The World Is Flat ). And it is important to consider scale. Rather than giving away a free sample to sell most of your product, think about giving away the vast majority of your work in order to scale up to many, many customers. You may only be selling something to a few percent of your total customers; with the vast majority being freeloaders. But if that total base is large and your work costs little to make — or, more likely, costs little to reproduce — the business model becomes solid. So from the consumer’s perspective, there is a huge difference between cheap and free. Give a product away and it can go viral. Charge a single cent for it and you’re in an entirely different business, one of clawing and scratching for every customer. The truth is that zero is one market and any other price is another. In many cases, that’s the difference between a great market and none at all. Certainly, this sort of pricing psychology can be applied either way. But in terms of creating a large, new market almost overnight; nothing compares to free. Free is really a sequel to — or, more accurately, the logical conclusion to — Anderson’s first book The Long Tail (which I previously reviewed). I feel confident that Anderson, too, sees it this way. I think he covers the key concepts of that book here as well in order to provide context. Actually, a sizable portion of this book is context: history of free as a price and marketing scheme and how the digital age has revolutionized its application. There is also a number of examples of the application of Free in real-world businesses and culture. What there isn’t much of is speculation on the future of Free. Anderson spares us from telling us how Free will change the world and spends most of his time explaining what effect it has already had. Furthering the case for Free as the son of The Long Tail, one of key ideas in Anderson’s first book which I pointed out was the importance of filters in making long tail businesses possible. Freeconomics takes the other side of this coin by assuming the long tail as commodity and the filtering as the scarcity; therefore making that again the key to success. Anderson makes a solid case in other aspects of free, as well. At least as solid as one can to measure something that is inherently unmeasurable. After all, larger numbers times zero are still zero. He uses a few rough calculations to show a sense of scale. Some have wrongly criticized the accuracy of these, but as an engineer I see the value in these "back of the envelope" estimates to determine at least the magnitude of the issue, if not the precise value. Additionally, he uses numerous examples of how individuals and companies apply free to make money and earn reputation and attention (which can, with some creativity, generally be turned into money). He even has an appendix of sorts on applying the concept of "Freemium2;" that is, giving away part of the business but charging for a premium version for a select few (generally 5-10% of the users). Clearly, this is where Anderson sees the greatest opportunity from a business perspective. This has worked amazingly well. Today, ten years after its founding, Google is a $20 billion company, making more in profit (more than $4 billion in 2008) than all of America’s airlines and car companies combined (okay, that may not be saying much these days!). Despite Anderson’s punchline at the expense of some of America’s last-century industries, I think in fact that this does say something quite substantial. Google realized that it had a number of commodities on hand from its search business: storage, bandwidth, computer horsepower; and saw to take advantage of it in anyway possible to extend its reach. Though many of its innovations were, in reality, acquisitions: YouTube, Writely (aka Google Docs), etc. ; it has leveraged "cloud computing" to get its advertising cash cow in front of more and more people. And when is the last time you paid a bill to Google3. Personally, I felt as though much of Free was tangential to the any argument of how to apply free tactics to a modern business. Most the chapters wander about in a very conversational style. The core of the book could certainly be boiled down into something much shorter4. Though some of these historical and economic tangents are interesting, they don’t do much to underscore the argument that free is important to business (not that that is the only purpose of the book, of course, but it is the title after all). Though Anderson attempts to create a taxonomy of free in business, it never really gels as to where various businesses fit in, other than the category of freemium; which, as previously mentioned, Anderson goes into great depth into and even sub-categorizes successful applications there-of. I also would have liked to see more concrete evidence of Anderson’s argument that free is something of a natural law in economics. I think that this is a key argument in convincing last-century business that free is indeed the price of the future. More accurately, I suppose, that changing their business model to giving away something that used to be a profit source in order to see revenue elsewhere. I suspect there is validity to this “free is like gravity” theory, but this book leaves me wanting some more sound evidence one way or the other. This book has generated some chatter and even controversy online5. Other than to acknowledge their existence, I don’t want to dwell on that. The book doesn’t exist in a vacuum but I’ll leave that sort of thing to others. Mainly because most of that has long since blown over by the time I was able to get around to finishing the text! 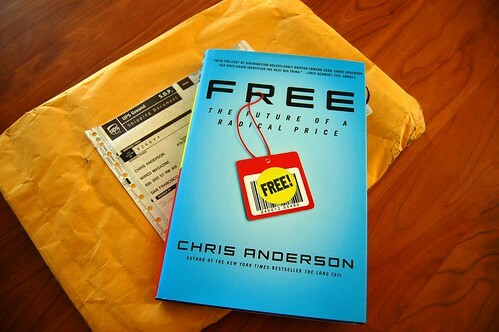 Free: The Future of a Radical Price by Chris Anderson on Hyperion books is available (for pay, in a spiffy bound edition) at most book sellers. True to his word regarding the research project nature of his book, it is also available free in ebook and audio downloads (with updated text). Since I’ve been all about listening to audiobooks lately (actually, for the past year – just more recently of the fantasy genre), this link was pretty timely. Using some of the integrated Apple services and some scripting, macOSXhints user miketyson put together a Service in OS X to simply convert highlighted text to an Audiobook and add to the iTunes library. I gave it a try with a webpage in Safari (the Speech → Start speaking text service doesn’t work in Firefox) and the result was pretty easy to listen to. The new Alex voice in 10.5 helps, though I don’t know if I could listen to an entire book this way. However, it’d be perfect for those longer New Yorker (and the like) articles I never seem to have time to read. It would certainly be nice to have this Service automatically switch the AAC encoding to “Spoken Podcast” instead of having to switch to iTunes and change the setting manually. I’ll inevitably forget to switch it back and end up with some really awful sounding music files, no doubt. Oh, to have blogged in so long and only to come back with a measly list of fluff. Well, something’s better than nothing, right? "Dungeons & Dragons" – That venerable fantasy RPG lost one of it’s founders last month. However, not to be stopped, a new 4th edition of the rules are being published in June. D&D has definitely come up out of Mom’s basement, showered, and decided that hanging out with some of the cool kids isn’t so bad, after all. This, along with the fact that nerds are now cool, might just make for a renaissance of table-top gaming. "Dragonlance" – When I was a kid, "Dragonlance" was the coolest D&D setting (at least to my pal, TJ, and I – he even had the campaign book). An animated film was released to DVD in January of the first of the original trilogy of novels. You know, the sort of the thing that every kid dreams about as they read fantasy novels at age 12? Ah, even at that age, I’d have understood just how bad this adaptation was. I was depressed but happened upon a fantastic graphic novel by Devil’s Due Publishing of the same series of novels made me almost completely forget what an awful film Dragons of Autumn Twilight was. I even picked up a new novel by the same authors, which so far has been quite enjoyable. Krull – Speaking of D&D and my childhood (the two of which are pretty closely linked), I learned from IMDb that the 80’s fantasy film Krull was originally to be the first official "Dungeons & Dragons" movie. I went back and watched it and too things struck me: A) it doesn’t really resemble D&D at all and B) it wasn’t nearly as good a movie as I remembered it being (Great way to start a career, there, Liam Neeson!). Then I realized that pretty much all movies based on D&D have been awful: Krull, Dungeons & Dragons, Dragons of Autumn Twilight. When a movie by the SciFi channel is the best of the back, that’s just plain sad. I think Wizards of the Coast should encourage a TV series, instead. Better yet: more graphic novels. Graphic Novels – Having read the graphic novel of Dragons of Winter Night, I went in search of more graphic novels to feed my endless need for scifi and fantasy. Oh boy, did I find them: Aliens, Predators, Aliens vs. Predators, Conan the Barbarian, G.I. Joe… okay that last one isn’t really scifi, but did I mention childhood nostalgia? Maybe that’s a better theme here. Anyway, I’ve been on a graphic novel kick and, despite it being a rather pricey habit, it has been very rewarding. A lot of these really represent some great comic book artform and I’ve determined are often my best hope for amazing fantasy visuals, gripping plotlines, and epic characters. They sure as hell aren’t to be found in any of the movies. Audiobooks – Lastly, I’ve also been on something of an audiobook habit (more posts to follow on this subject). I was able to find some really great audiobooks by R. A. Salvatore and Michael Moorcock; two men who write about troubled anti-heroes with long, white hair. 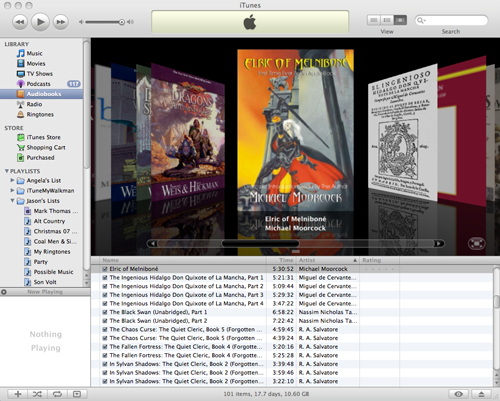 I even found audiobooks for that original Dragonlance trilogy I mentioned. There’s just one drawback to the audiobooks: I used to listen to these (along with podcasts) on my commute. Now that I hardly drive at all, it’s going to me forever to listen to them all! Well, before you give me a wedgie and shove inside my locker along side my Player’s Manual, I should also say that I’ve been enjoying Season Two of The Wire, as well as all this fantasy stuff. Perhaps that explains it: I needed something whimsical and out-of-this-world to balance out the dark, gritty nature of a show like the The Wire. At least, that’s why I keep telling myself.